Whose idea it was to get me a fly rod one Christmas I don’t know. Maybe it was my own idea. Maybe Santa Claus’s. Most likely it was my wife, Beth’s. Unlike me, she’s good at filing away gift ideas during the year. So, after Santa made his delivery, I was set up with a basic Orvis 6-weight and most of what I needed to get started. Oddly, it wasn’t until a few years later that I finally procured a vest, but I didn’t have a lot of stuff starting out. Between a pocket in the bib of my waders and a little Crown Royal bag I hung onto a buckle, I was able to cart along a small box of flies and a few other necessities. As these things go, you could probably still find a fly or two from that first batch in my current collection, this many years later. Like most common folk, I assumed it was all about the cast. In retrospect, I guess it is true that you need to get casting out of the way before you can discover the multitude of other mysteries that come along in a lifetime of fly-fishing. Between the Orvis book she included know. Maybe it was my own idea. Maybe Santa Claus’s. Most likely it was my wife, Beth’s. Unlike me, she’s good and the gift certificate for lessons, Beth had taken care of the casting, too. I started out practicing my casts in the backyard of 128 Reed Street, Lexington, Massachusetts, the house we moved into just a few weeks before our nuptials. I’d read somewhere that you are supposed to tie a little piece of fabric or some yarn on the end of the fly line—for visibility, I supposed. I’d carefully placed a trashcan lid in the snow about twenty yards out from where I stood. There wasn’t a lot more yardage than that in my little yard, especially when you account for the backcast, which initially I hadn’t. Out of the box, I hung up the line in the pear tree that matched the painting Billy gave us as a wedding gift. I dug the iced-over wooden ladder out of the snow behind the barn and managed to free the line. But I didn’t flip and flop too long before heading in to review the pictures in the book. Come spring thaw, the lessons at Orvis in Wayland were helpful. The open shore of Lake Cochituate brought to mind the casting pools next to the polo field in Golden Gate Park I’d run past so many times during my “year of living impulsively.” Even then I’d been intrigued by the old guys out on a Tuesday morning, casting back and forth with that graceful motion and what I now know as tight loops. Since my Orvis instructor would take two for the price of one, Beth came along for lessons as well, and it quickly became apparent that “She could’a’ been a contenda!” Actually, we both did okay, and after a couple of hours felt ready to slay the wiliest of trout. It was during the summer of 1992 that I landed my first beast, one of many highlights that wonderful summer. In June, Beth and I had made the decision to migrate to Hanover, and it worked out that I was not to start my job at High Performance Systems there until mid-September. I was off for nearly three glorious months. The kids were almost two and four, and we were living on the Cape. One fine afternoon, I packed up rod, tackle, waders, beers, wife, and kids and drove a few miles down Quinaquisset Avenue to the headwaters of the Mashpee River. A hundred years ago there was fine trout fishing in the Ice Age-created streams of the Upper Cape. Sea-run brook trout, or salters, were sport fished in coastal streams all along the New England coast. Eventually, cranberry farmers on the Cape cleared away many of the trees that shaded these streams and channeled the water to irrigate bogs. All that added up to trout being subtracted from the Cape’s list of sport fish. For the last three decades Cape Cod Trout Unlimited has been working to bring back the population, their efforts focused on the Quashnet River, the headwaters of which are just a couple of miles west of the Mashpee. The river where I embarked didn’t look a lot like the pictures in the Orvis books. (One day I would learn that there were sources other than Orvis for fly-fishing equipment and knowledge.) The river I chose was kind of overhung, the water was slow, and there were no rocks jutting upward or cut banks that the diagrams had indicated were sure places for fat trout to lurk. It was just water flowing between winding banks that didn’t allow a lot of visibility. My gang on shore erupted with high-pitched cheers after I’d slid in up to my waist and flipped a nameless dry fly out into the light flow. It was my first real cast, about a twenty-foot roll cast, as there was not a lot of room for airborne line in any direction. One, two, three, four . 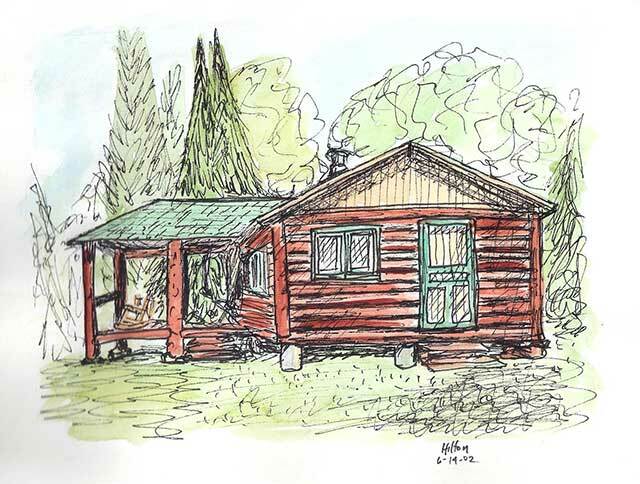 . . the fly couldn’t have sat five seconds before it was struck like a gong by a ten-inch brook trout. Not really. Actually it sat there undisturbed for considerably more than five seconds. And no fish. The fly just sat there on the water, and I just watched it. After a while I concluded that it may not have been the best spot for a fish after all. “No, not yet girls; maybe next cast!” I called to my peanut gallery. I tried one over there. Then over there. And then another. I had my first taste of that multi-dimensional, never-solved fly-fishing conundrum: is it the fly pattern, color, size, drift, retrieve, location, depth? Or is it just that there are no fish? Or am I the worst fisherman on the planet? Probably some of all of the above. It turned out there were fish, or, more accurately, there was a fish. My first on a fly. He was about five inches long, and I got him about twenty minutes later while changing positions and dragging the fly behind me, a technique many of us have since found surprisingly and, in a way, insultingly productive. But a fish is a fish. My first small success that summer day in the Mashpee River inspired me to keep going for a while, but the kids were soon ready to retreat. And so ended my first fly-fishing expedition before the Grant trips. It was a fall football weekend in my new hometown of Hanover when I bumped into Bill Burgess, Dartmouth Class of ’81 and a friend from Cotuit. 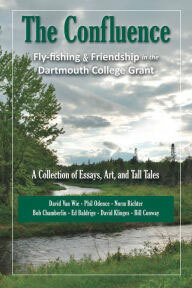 The story of my stunning success on the Mashpee River captured his interest, and out of that discussion emerged the idea of a trip to Dartmouth’s Second College Grant. Soon thereafter, I must have called Guy, the only fly fisherman I knew. He was game, of course, and thus was born our first June trip. And so it was that one fine evening the following June, Burgess arrived at 6 Ledyard Lane, Hanover, in time for a late dinner. In addition to his duffel and sleeping bag, he was laden with a panoply of recent purchases. One day he too would learn about the world beyond Orvis, but not that day. Every one of those packages sported an Orvis logo. Owning exactly zero fly equipment when he awoke that morning, he’d left his desk in the mid-afternoon and beelined it to the downtown Boston Orvis store. Forty minutes later, Bill told me, he emerged from the store fully outfitted, with an additional $1,000 charge on his American Express Card. Tossing bags and boxes into the back of his Jeep Cherokee, he headed directly to Hanover. We had fun after dinner, winding fly line backing onto a virgin reel, sorting and re-sorting flies into shiny new boxes, and drinking all my beers. The timetable and logistics formulated for our inaugural departure have altered little over decades of Grant excursions: late to bed, early to rise, and then straight to the LL Cote store in Errol for whatever items we have forgotten, plus our New Hampshire fishing licenses. It may also have been on that first trip that we worked out the double-secret key-hiding spot and initiated many of the other traditions that stand today. Burgess and I entered the Grant alone, ahead of Guy who was to arrive the next morning, and he ahead of his brother Doug and Burgie’s friend Mark “Hubie” Heuberger. Which is how, on that first day, Burgess and I came to be the proverbial blind leading the blind. 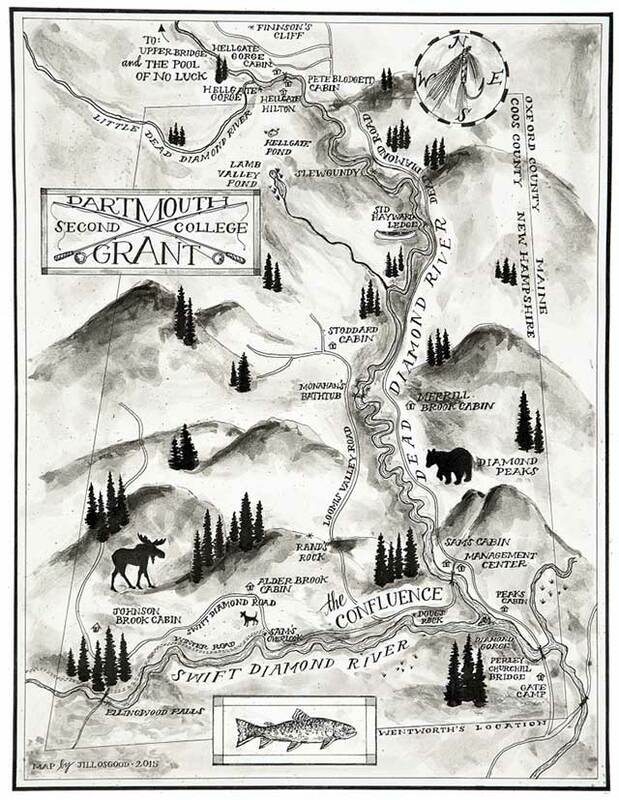 Once situated in Merrill Brook Cabin, we laid out the topo map of the Grant on the table in order to locate the river. We drove around much of the afternoon, scouting our options. Here and there we tried wading in a little, and I recall passing along some of my Orvis learnings. Our first real fishing was at the placid pools of Slewgundy late that afternoon. Slewgundy. I will never be able to hear, read, think, or say the name without singing it in my head to the tune of “Moon River,” as in “wider than a mile.” Sloooooo-gun-deeeee! And, it was probably the name that attracted us to the spot. The water was fairly high, but we were able to get ourselves out across the jutting rocks that divide the upstream pools from the big one downstream. There’s little room for more than two fishermen at Slewgundy. The best spots to fish from are atop the rocks separating the pools. When the water is low enough to get across on those rocks, one person can fish on one side and the other on the far side. We have since learned that an additional person or two can work their way around to the glide above the upper pools. But on that night, it was just Bill and Phil perched between the large, slow stretches of water. For quite a while there was little activity. It was a bit reminiscent of my Mashpee River outing: water, flies, no idea what was going on underneath, and only a vague idea of what was going on above. How about here? How about there? But it was all good. Very good, in fact. We were out well beyond civilization, in real fish country, two guys, no kids, and a bunch of beers. Everything we could ask for to keep us in the game long enough for The Hatch. I’d read about what a hatch looks like, and this was clearly one for the books. The memory may have been embellished a bit, but I am completely confident that, should we encounter a similar hatch today, it would cause each and every one of us to piddle our waders. And we’d certainly be better equipped to capitalize on it than Bill and I were that long-ago night, which is the point of the story. It was an amazing sight. Suddenly the air was rich with hundreds and soon thousands of insects rising off the water, as they emerged en masse from below, transforming from nymphs to adults for their next life stage. It was as if a bomb had gone off under the fly counter at LL Cote. And then there were the rises. We noticed one here, one there, all frustratingly outside the range of our awkward casting. But soon expanding circles of water were everywhere as trout slurped and splashed and devoured the helpless bugs as they emerged from below and were poised momentarily on the surface of the water waiting for their wings to dry before taking flight. It was more than a little heartening all of a sudden to have a target to aim for. And it didn’t matter if you were off because there would be another rise near where your fly ended up anyway. Cast to one rise forward and there’d be three behind. There was no such thing as a back- cast; you could just flip directly from the pool in front of you to the one behind. It was like shooting fish in a barrel—for someone with really bad aim and a really big barrel. Guy remembers that we caught something. I’m not so sure, but Burgess is quite certain we didn’t (and he’s now a Dartmouth Trustee, so we have to trust him). Maybe we had lied to Guy, rounded up, as it were. That would explain his memory. In any case, we certainly did not cash in on this epic opportunity. It didn’t matter. Burgess and I loved this fly-fishing thing. Looking back, that moment reminds me of a golf outing with Gerry Henderson, a sage old friend of my dad’s, one summer during college. Off the tee on a long par 4, I accidentally drove one about 250 yards down the middle with perfect trajectory. As I looked up, I must have had a grin wider than the fairway. Gerry read my mind as he shook his head and said, “You think it’s going to be like that every time now, don’t you?” I did, and that’s just how we felt that night at Slewgundy. We had discovered fly-fishing. It was going to be like this every time. Bugs galore, rises everywhere, catching fish, and drinking beer. With respect to the beer at least, we were pretty accurate. But in twenty-plus years, The Boys and I have yet to see another hatch anything like that first evening at the Grant. Peter E. Randall Publisher, Portsmouth, New Hampshire, 2016. Copyright © 2016 by David A. Van Wie, L. Philip Odence, Norman Richter, Robert Chamberlin, William B. Conway, Jr., David H. Klinges, Jr., and Edwin R. Baldrige III. All rights reserved.